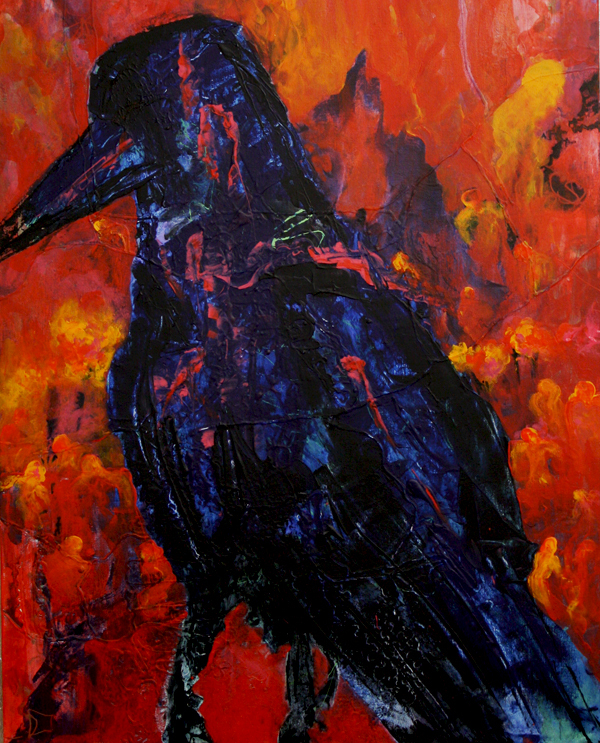 This 2012 painting is the first in the Huginn and Muninn series. It is painted with latex house paint, on canvas. This series was inspired by a photo that was taken by my nieces’ fiancé on his trip to the Grand Canyon and by their upcoming marriage. As a wedding gift I was asked to do a painting about their story and their connection with the ravens in this photo …. Huginn and Muninn, (a sweet inside joke for the couple). After doing research on ravens and the story of Huginn and Muninn I decided to play … to let the feelings simply explode on canvas and see what happened. The painting developed and the thoughts running through my head poured on to the canvas, Huginn began to take form. It must be noted that this painting was not always a raven. The under painting is layered. The original painting on this canvas was of a female figure which lacked the emotional element and mystery that are important to me as an artist, as M. Douglas Walton, a very special artist and teacher might say “the painting failed to reach its potential.” Although the female figure is now painted over her presence is still there and a part of the final painting. The second layer was applied as an exercise in color combinations. I explored putting colors together that I enjoyed and let them mix together, building values and textures along the way. Each step of the painting was a process and an exercise in experimentation. With this process came the realization that we as individuals are going through a process of development too. We are not always reaching our true potential or our best self. The journey is a necessary part of the evolution. After all, Michelangelo’s ‘David’ was once just a hunk of granite. Huginn sits on a hint of a perch, high in the sky; he is timeless and knows no limits in space. He watches and studies the domain below him, not resting but deep in thought. You may eventually notice the mountain far into the distance. Like Mount Ranier its summit is so high that the atmosphere clouds your visibility. Notice, Huginn is perched higher still. The layering of blues and darks and building of texture keep Huginn interesting to look at and alive while the use of texture used in his feathers show the wear and tear of time. The warm colors in the background hint of landscapes and figures that are more lost than found … they sneak up on you as you spend time looking at the painting. Are those the fiery furnaces of hell and tormented souls you are seeing or simply past generations finding their way through time? The mystery is there and the emotional statement made. It is up to you, the viewer, to enter the painting and have the painting tell its story. The story changes with each new day and each viewer’s insights. The conversation between the viewer and the painting are never the same. It is this ever changing conversation that keeps this painting fresh and timeless.